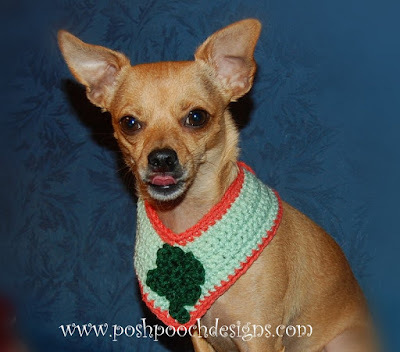 We Have just retested and Updated This Crochet Pattern. We also added a few more sizes. I think would be great in any colors, for any Holiday. Just change the Shamrock to a flower, heart, or star. or any applique, button or bow. R : 7 - Change to trim color, ch 1, turn, 26 (30, 44)sc, 3 sc in the next st, 26 (30, 44) sc, turn up the side of the collar and evenly space 5 sc, 9 sc across bottom of strap, 3 sc up the end of the strap, then turn and sc across the top of the collar, skipping the center stitch, continue across to the end, 8 sc down the side of the collar, join, tie off and weave in the end. then lace the end of the strap through the two rings securely. tie of leaving a 10 inch tail for sewing in place. Rosie is sticking out her tongue. LOL! 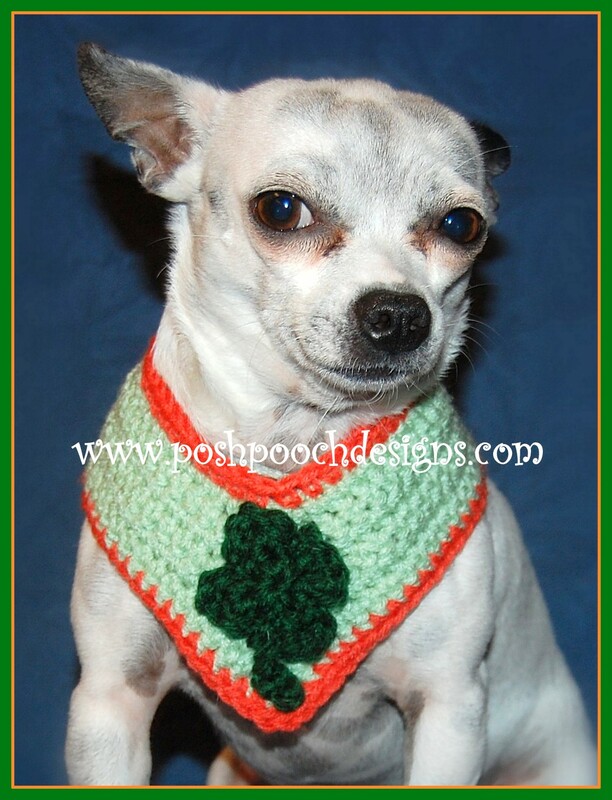 But she does like the new shamrock Dog collar. I think she was licking her lips in anticipation of a dog treat. oh that is adorable. Your Rosie looks very much like our Rosie. Our Rosie would be a very reluctant model though. Have a great day. My dogs are growing at the computer; they are so crazy! I am a new visitor and follower via I love my online Friends. Rosie is a great model! Cute! Even Chihuahua's want to be Irish on St. Paddy's day. Help! My Chihuahua is Itchy! Happy Birthday to Maximo and Rosie !